The Knight's Armament Company of Vero Beach (Florida) introduced a sub-compact pistol known merely as the "KAC-Pistol" in 1992 to the surprise of many. 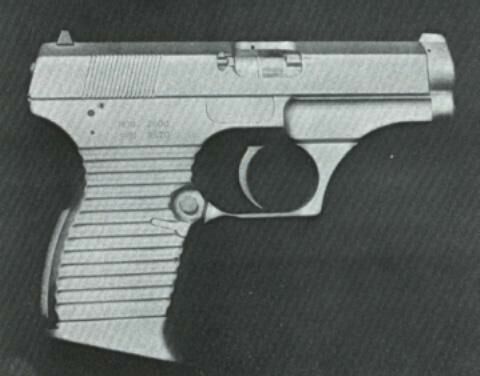 Utilizing a delayed blowback operation the pistol was designed as a demonstration model for evaluation amongst law enforcement and military circles. The trigger mechanism is design to be self cocking to remove the need for a external hammer, as such the mechanism is carried on roller bearings for a consistant trigger pull with each shot. The manufacturers claimed the weapon was capable of being used as a concealed weapon but yet robust enough to be used a primary defensive arm. However, the "KAC-Pistol" exemplars sent for trial to Military nd LE agencies along the globe were unsuccessful in their task to reach adoption; so, this weapon never reached mass production, and is unclear how many copies of the pistol were produced for the general public, if any. --- TECHNICAL SPECS: CALIBER: 9x19mm-Parabellum CAPACITY: 14 rounds OVERALL LENGHT: 172 Millimeters BARREL LENGHT: 151 Millimeters OVERALL WEIGHT: 822 Grams RIFLING: 6 grooves, RH =WARNING= The sources of informations about the KAC PISTOL are very few and rare to find, furthermore I'm no more able to access the source of the Technical Specifics. So, I'm not sure the Technical Specs I'm posting to be totally exact. If somebody has different informations, PLEASE FIRST OF ALL CHECK TO BE SURE THEM TO BE CORRECT, then send them to ME and to the website.